Silverdale Scorpions under 13’s are looking for new players, experienced if possible but not essential to join our team Year 7 or 8 at school. We pride ourselves on progressive coaching in a friendly environment with supportive parents. We train on Wednesdays night 7 till 8. Please contact Andy on 07983528010 if you are interested in joining the team. Great Barr Harriers Town U13’s are looking for new players. We train on Wednesdays 6.30pm to 7.30pm. 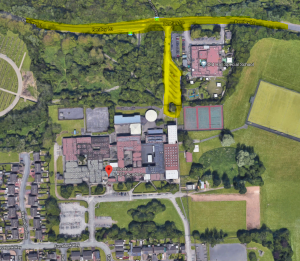 Under 12s teams playing at e-act academy this Sunday (16th) please note that this weekend only there will be extra parking available. Please respect local residents and do not park blocking drives or park on the grass. From next weekend kick offs will be staggered to make parking easier. Thanks for your assistance. Experienced players for the forthcoming season required for AFC Willenhall. 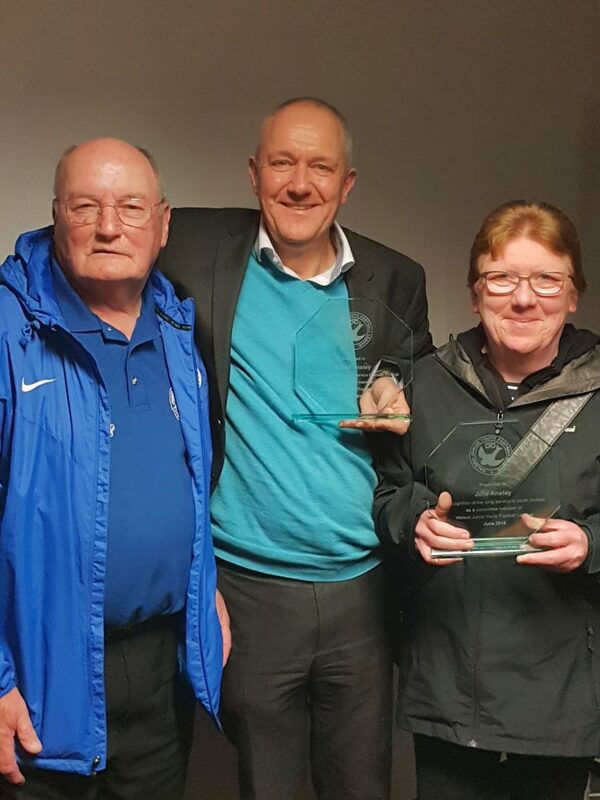 Parents can either contact myself Dean on 07778372521, or alternatively I will be holding a training/ trials night on the 6th July 6.00pm – 7.30pm at Willenhall memorial park, off noose lane. Fancy a new challenge ? We are looking for new players to join our successful team as we move up to under 13’s 11 a side next season (Players must be starting in year 8 in September). We are experienced trained coaches who train in the Bloxwich area on Wednesday evenings and Saturday mornings and our matches are on Sundays. We are a friendly committed team with supportive parents. If you want a new challenge we welcome you to a trial. For more information please contact Andy on 07825 640326 smilerb@blueyonder.co.uk or Mark on 07908 776781. We are looking for new players to join our successful team as we move up to U13’s & 11 a side next season (U12’s so currently in Year 7). If Tipton, Walsall wood or Wednesfield wanted to play a friendly then that could happen. These 3 pitch slots relate the winter games above. Unfortunately a decision has been made to call the games off today as the grass is too long. WSU require experienced and hard-working players in all positions for the coming season. 2 FA Qualified coaches with a lot of experience in coaching children. Fun packed sessions with lots of sessions that are sure to develop the child as an overall player. We are a charter standard club with an excellent reputation for putting the development of the kids first. We are looking to add enthusiastic & committed defenders and a striker and looking for players who want to get the ball down and play. The manager & coaches promotes and encourages players to play out from the back with passing and moving football. Training is held on Tuesday’s & Friday’s 6.30-7.30pm on both days at kings hill park Darlaston/Wednesbury. Looking for a goalkeeper and 3 outfield players. To join ready for the 11 v 11 move up. Shelfield Kestrels U12 are looking for additional players (current Year 7) as we expand to 11-a-side at U13 next season. As we look to move to 11v11 next season we are looking for a few decent players to add to existing squad and build upon our success this season. We are based in Rushall by the Manor Farm School. Stonnall Juniors U12 are looking for additional players (current Year 7) as we expand to 11-a-side at U13 next season. Please contact Mark 07834 458752 for more details. Hednesford Town Newlands Fc u12s Falcons are looking for a few new players (current school year7 ) ready for new 11 v 11 season. Text the manager (Ade) anytime on 0775 9242868 alternatively please call after 4. Training Friday evening 6 till 7 at Burntwood Leisure Centre. Sunday 11 March. Bentley West Centre is OFF due to waterlogged pitches. Sunday 11 March – pitch 1 only at Bustleholme 9v9 Centre is OFF today waterlogged. Teams involved are aware and later kick off times have been offered. Year 7, currently playing in division 2 in the Walsall League. A warm welcome awaits a much needed player! 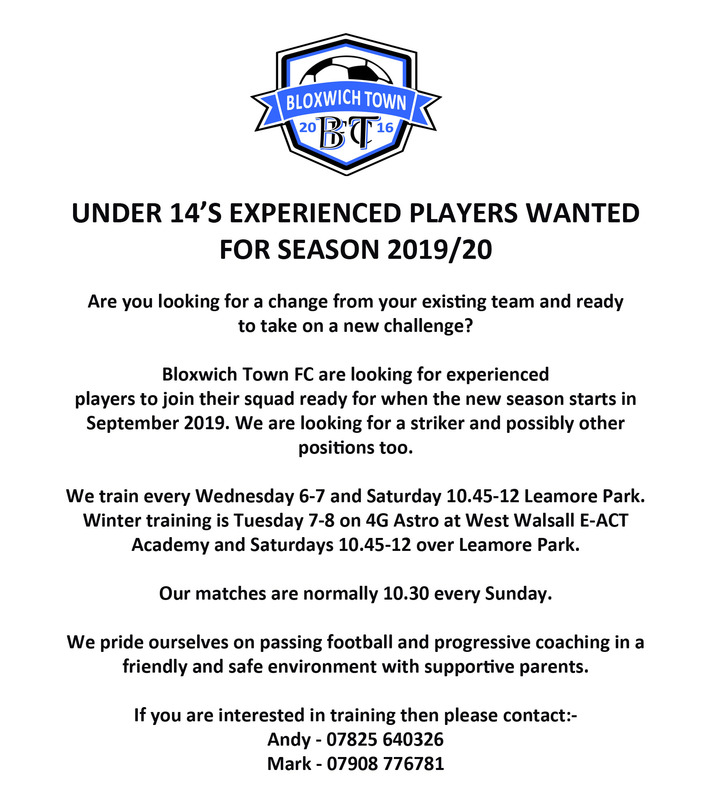 Please contact Andy from Bloxwich Town FC for any info and a no obligation trial on 07826 640326. Last call for anyone looking for a team before registration closes this Friday. Silverdale Scorpions are still looking for a few players to join our team we are friendly group who like to enjoy our football. Futsal for Year 7 pupils. 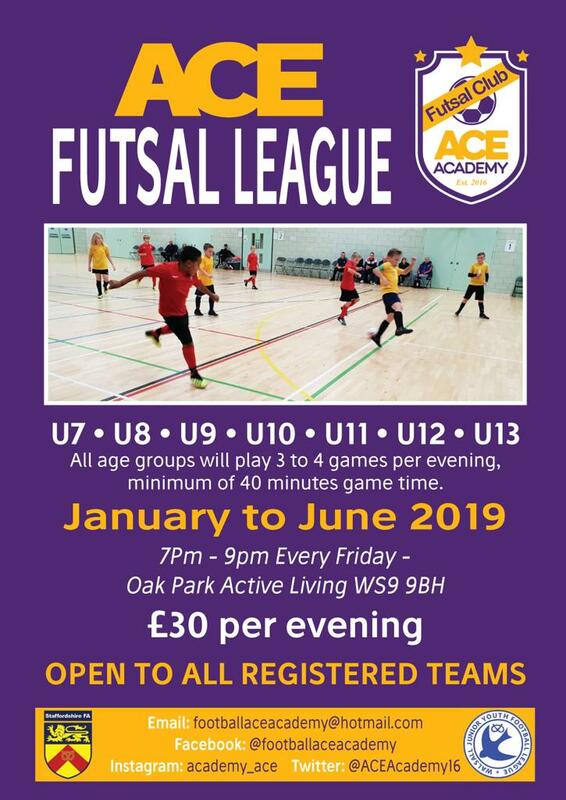 Want to get into futsal? 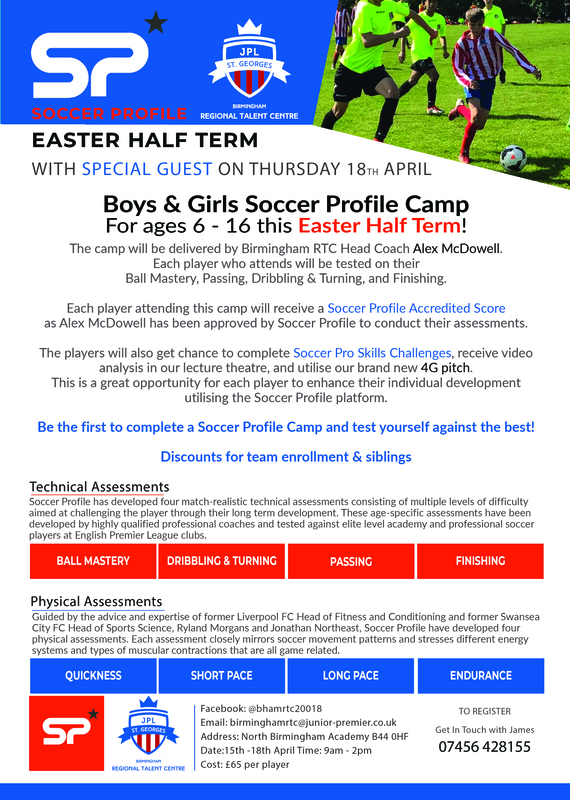 Free introductory sessions on Friday evenings in March for potential players in Year 7. FA Level 2 qualified futsal coach. Please contact Mark 07834 458752 for more info Stonnall Juniors. 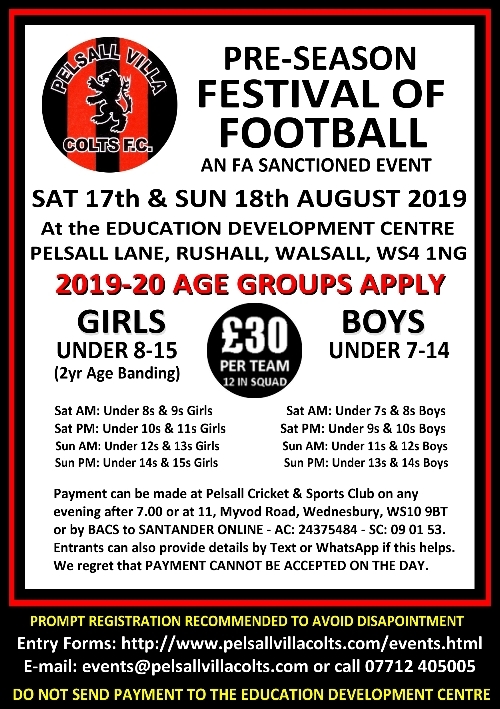 Well we are 4 players short of a full team and need players for our new team after break up this year of the old Brownhills colts which players have all gone to new teams. 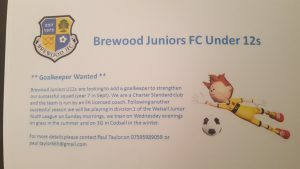 Stonnall Juniors U12 are looking for additional players. We have a UEFA B coach and practice on Tuesdays and Fridays. Happy to consider an additional goalkeeper who would like to play outfield as well. Silverdale Scorpions under 12s are urgently looking for new players, experienced if possible but not essential to join our team (U12’s so in Year 7). Wednesfield 9v9 Centre is OFF due to waterlogged pitches. It is being reviewed to see if these games can be moved to other centres. If they can a further notice will be posted. There is no news from other centres currently. Please do not ask because as soon as news is available updates will be posted. Thanks. Wyrley Juniors v Bustleholme Villains u12s are playing at Bustleholme at 12.30. The pitches are waterlogged and the Centre is not available this coming weekend. We are currently looking at whether some of the games can be moved to alternate venues and will advise accordingly. GAMES WILL NOT BE MOVED TO OTHER CENTRES. MATCHES OFF. Our u12 Falcons are looking for a few new players who can join immediately. Preferably someone that has been playing in midfield. Text the manager (Ade) anytime on 0775 9242868 alternatively please call after 4. They train on Astro Turf at Burntwood Leisure Centre on Monday Evenings between 6 till 7 and play in the Walsall Youth League. 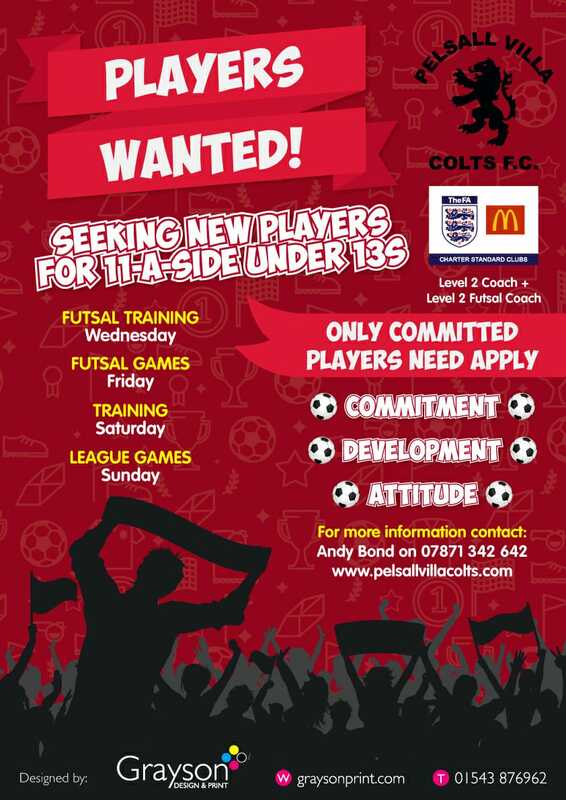 Stonnall Juniors U12 are looking for an additional player in readiness for next year at 11-a-side. We have a UEFA B coach and practice near Aldridge on Tuesdays (football) and Fridays (futsal), so motivated players/parents a must. Kings Hill Centre has been inspected this afternoon and confirmed ON tomorrow Sunday 7 January. 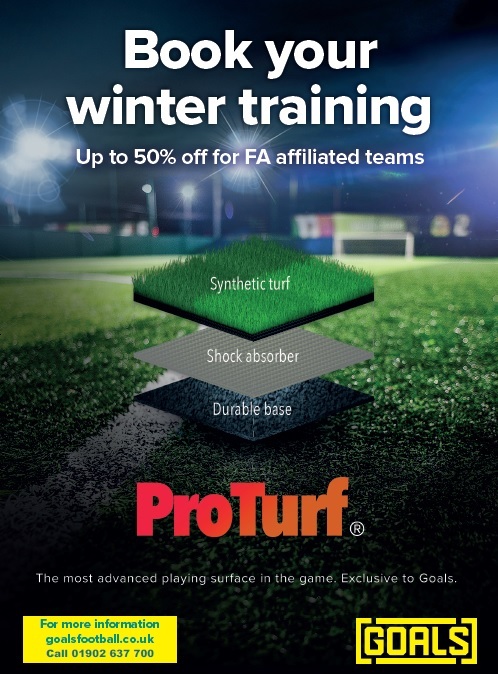 Aldridge Airport soccer Centre 9v9 is OFF tomorrow Sunday 7 January. Sunday 7 January, 9v9 Centre at Wednesfield are OFF due to waterlogged pitches. Sporting Stonnall are looking for another player for their Under 12s side for the rest of the season. We are a supportive team in which enjoyment and individual/team development are the most important factors for our players. Training is on Tuesday evening (7pm-8pm) at Bloxwich Leisure Centre and Saturday mornings (9.30am-10.30am) at Stonnall Playing Fields. If interested contact Shaun 07792724024. Bustleholme Soccer Centre – all games on pitch (2) 9 asides are OFF today 3 December. We are looking to recruit extra players to our current squad. We train on Wednesday nights 6.00 – 7.30 at Aston University recreation Centre B43 7AJ. All players are guaranteed game time every week. We have a welcoming and supportive group of players and parents so if you would like your child to play football and improve their fitness then please come along. Unfortunately the matches below will not take place at Aldridge this weekend as Walsall Council have advised the pitches are unavailable. We are looking for new players to join our successful team (U12’s so just started Year 7). Great Barr Harriers Town U12’s are looking for a defender to join our established team who are currently in Division 1. We have a great bunch of lads, a great bunch of parents and Great Barr Harriers as a club are all about the kids. Must be in school year 6 or 7. The team is run by an FA licensed coach and an ex-professional footballer. Please contact Rob on 07817 627 205 or email robtaylor1083@gmail.com. 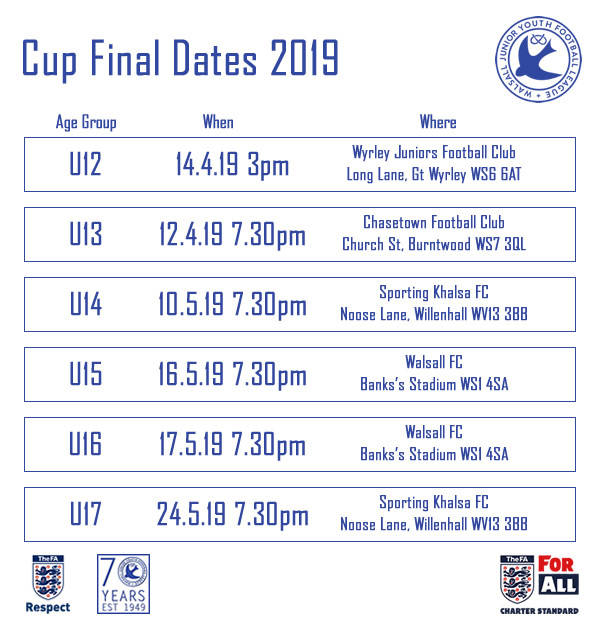 football in WJYFL and for our futsal teams. We train on Tuesdays (grass) and Fridays (futsal). Our team has been together for four seasons and we are looking for a well-rounded player (not just Technical) who will fit in with our existing team. Coach: current UEFA B candidate; Level 3 (Youth Modules + assessment) + Futsal L2 + Goalkeeping L2; WBA Talent ID. Please drop me a line for more details. Shelfield united Kestrels U12 are looking for a few players in all positions to add to our squad. 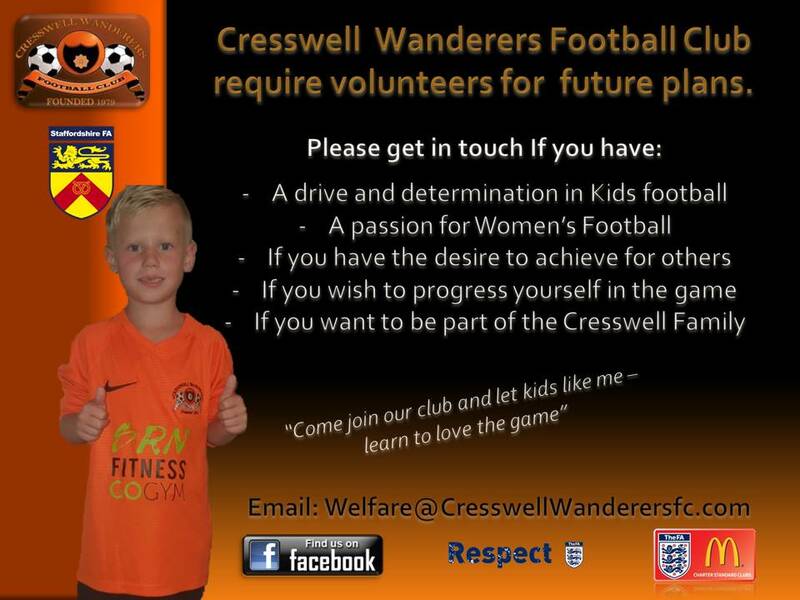 We are based in Rushall at manor farm school, train on a Thursday and Saturday, play our game on a Sunday. If you are interested please contact Ricardo on 07870439662 or email djchill79@me.com we are a team of mixed ability and looking to move to the next level with a lovely supporting parent group. Want a couple of players for this season, we are in division 3 and looking for a couple of good steady players who want to win and commit to the team with a future. Phone Phil on 07542819620. 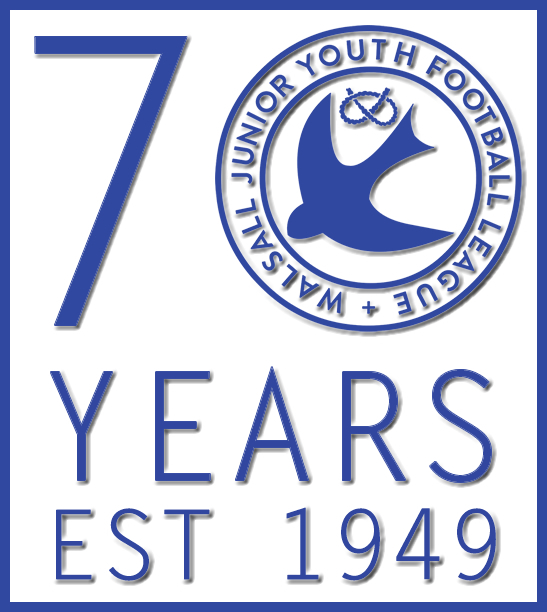 Bloxwich Rangers u12s are looking for players for the 2017/18 to play in the Walsall junior youth league. Coaches are minimum level 1 FA qualified and crb checked. If you want a change or a new challenge then please call Andy on 07874326492 or Daz on 07810608287.